A special family within the Chinese Export porcelains are pieces decorated with black enamels enhanced with gilt and sometimes with iron red. The group seems to first have made its appearance by the early 1740's and to somehow have stayed in vogue until the 1760's. The decoration is known under different names such as encre de chine or grisaille. The decorations on most encre de chine pieces was copied from black and white book illustrations with romantic, mythological or religious themes. It seems likely that the Chinese porcelain decorators must have assumed that the black and white decoration somehow was preferred over colorful enamels, and the thought that this was not only due to lack of skill and ambitions with the European printers does not seems to have occurred to them. Besides, the "customers are always right" so, they most probably just delivered what was ordered. 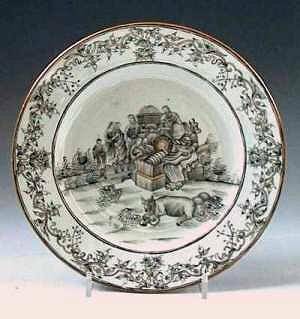 One of the most charming plates is "The Adoration of the Shepherds". The original in this specific case is an engraving by the Amsterdam artist Jan Luyken (1649-1712) which were used in several Dutch Bible editions. 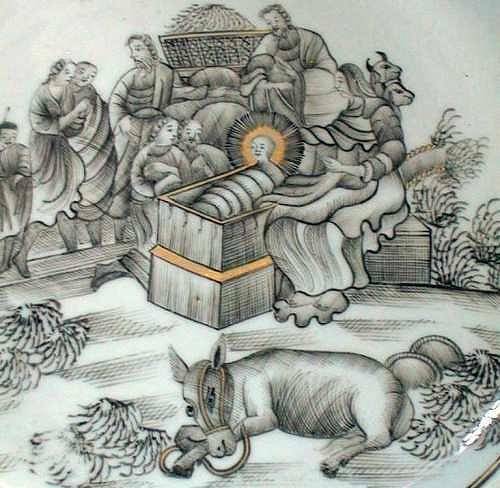 This decoration was possibly taken from a Bible brought by some of the Jesuit missionaries visiting China. The carefully worked out border design in black enamels appears to rely on an European design print from the 1730's and are often connected with the Austrian porcelain factory founded 1718 in Vienna by the Dutchman Claude-Innocent du Paquier. This would give us a possibly connection with both the Austrian "Ostende" East India Company and the Dutch market, which would help us explain both the rarity of these designs as well as their early appearance. From a general arts historian point of view the border also have similarities with work by Francois Boucher (1703-70).